When it comes to Supercross, most wonder what it would be like to ride it, let alone make their way around the track. Once you've had the opportunity to walk a track in a stadium, you begin to wonder even more...like how in the heck does not only the rider, but the bike itself deal with this madness? For the factory teams, resources might seem nearly endless when developing a bike to take on the circus of jumps. But what about for a private team? Well one private team stepped up to the plate this year by not only getting their bike on the podium multiple times, but also taking a win at Daytona. 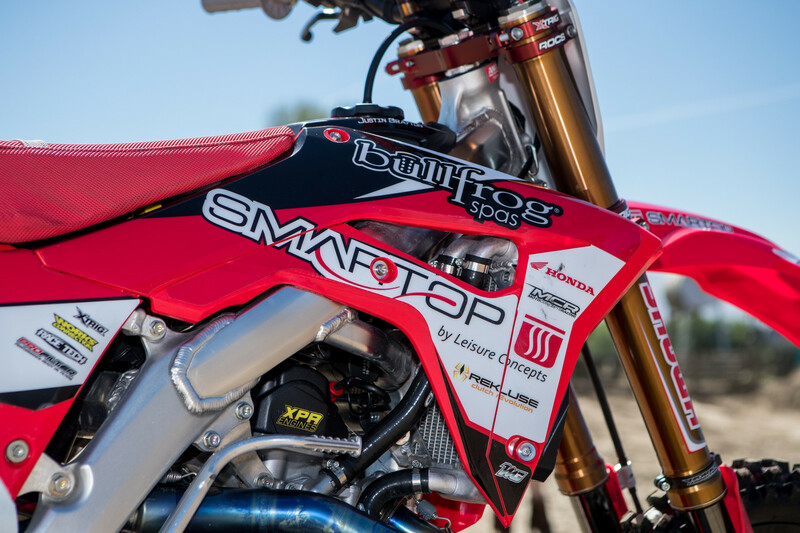 Yup, we're talking about Justin Brayton and his Honda CRF450R, developed by the Bullfrog Spas/Smartop Racing Team (MotoConcepts). 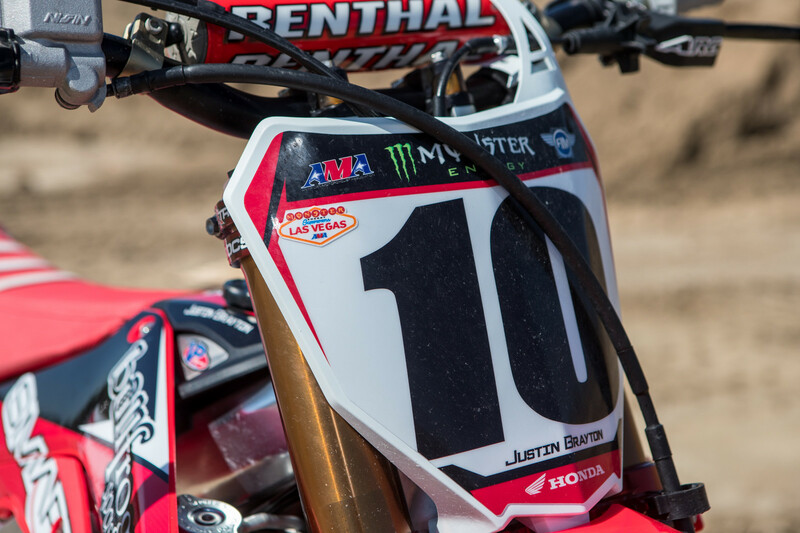 Click play to hear Justin Brayton's thoughts on the team, his bike, and the future. While some people may have viewed Brayton's bike as a HRC loaner, this is nowhere near the truth. There are three main items supplied by HRC for Brayton's use; works Showa suspension, a billet Nissin front brake caliper, and a different first gear ratio...but beyond that this bike was developed by the team with aftermarket parts and a few key partners. We found this quite interesting as Justin Brayton has been in the game for a while now, working with some of the best teams in the pits, meaning he knows what he wants and he's been with teams that'll make it happen. So how good must the MCR bike be? Good enough to get him to sign up for a couple more years. Let's learn a bit more. Due to the time constraints related to the bike and parts, in 2017 Justin Brayton was the only member on the team with the newest generation Honda. This was in part due to Honda wanting him on the bike and supplying it. Outside of the suspension and triple clamps that were supplied by HRC, it was up to MCR to develop the bike. After a season with the 2017 model and getting the other members of the team on the new platform, a lot of time and R&D went into making their 2018 bikes capable of racing at the top of the field. 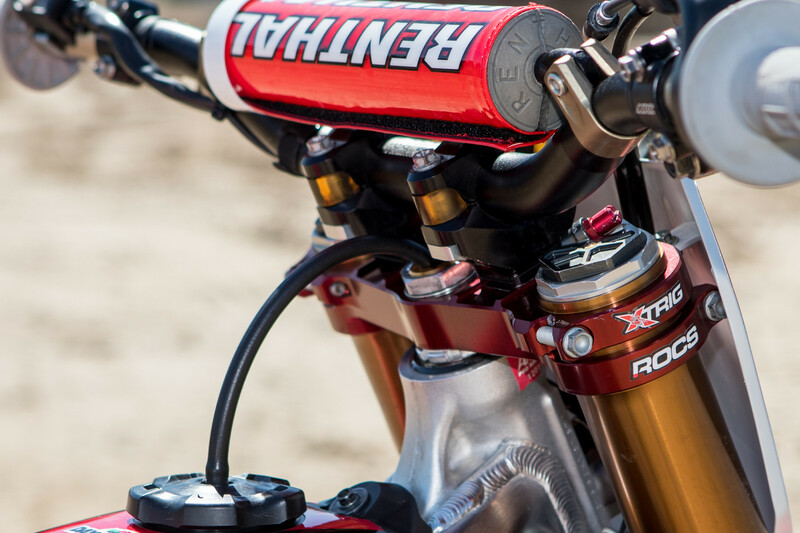 Click play to hear MCR's Team Manager, Tony Alessi, break down how the team has developed their latest Honda and to learn more about their relationship with the brand. Each bike started out as a 2018 Honda CRF450R, fresh from the crate. From there the wiring harnesses are changed, and the battery/electric starter system removed in favor of the kickstarter from the 2017. This was done to drop weight and to free up the engine slightly, due to some comments and feedback from Justin. The team didn't employ the use of titanium fasteners this season, so any drop in weight was helpful. From here the engines are all handed over to Chad Braun at XPR Motorsports. Chad's involvement with MCR spans quite a few years, working with them when they first left Yamaha in favor of Suzuki 450s and Honda 250s. 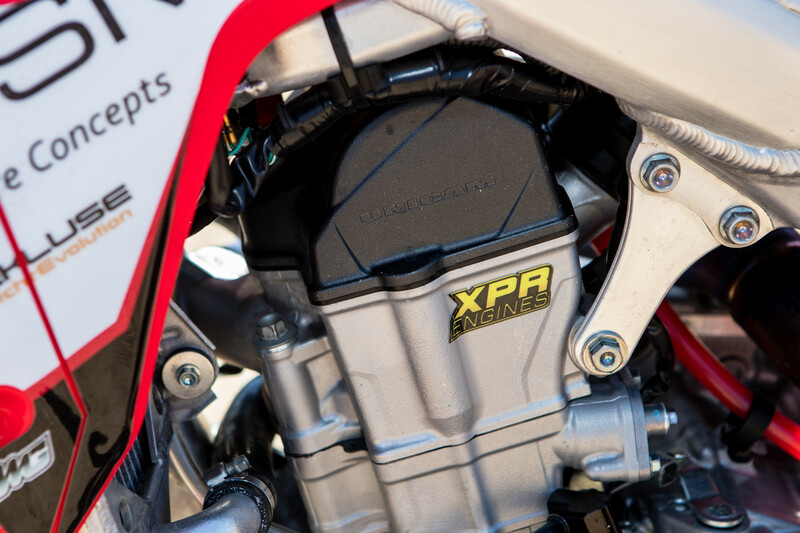 For the latest generation CRF450R, he was let loose and developed his own piston, cam, and cylinder head spec based on the feedback he received from Brayton. This also includes a complete crank, a few flywheel options, and custom mapping done by Chad himself on a Vortex ECU. While there is a part or two inside the engine that's geared a little more towards performance over reliability...about 95% of it is available to purchase if you just give Chad a ring. Inside there is one unique part we can mention, a different first gear ratio supplied by Honda. This gear is a little wider spread and allows the riders to nail those tight triples right out of corners in first gear if need be, which happens more often than you'd think. Beyond that, the parts are all sourced by different suppliers to XPR's specs, and the clutch is a Torque Drive unit from Rekluse, which was a new partner for 2018. Click play to hear from XPR's Chad Braun. From the outside a little more is visible, such as Yoshimura RS-9T exhaust system, which is right off the shelf. Actually, there's a lot of off-the-shelf parts on the bike when you give it a good once over. To try and make this list concise, check out the items below with each modification. Brands and parts are listed, plus notes if there was something different or unique about that item. All-in-all, Brayton's CRF450R could be considered surprisingly stock and obtainable. Things like the hardware is stock (steel bolts instead of titanium), no bracing to the swingarm or frame, or anything else that would effect the flex characteristics of the bike. Arguably, some teams can take things too far and lose some of the feel of the stock bike, which Justin quite likes. Because of this, Tony Alessi and his crew are very mindful, adding components to the bike only if they're truly an improvement over the stock parts. A good example of this are the hubs, as the team had utilized the stock units but only switched the rear hub due to a failure in pre-season testing with Jake Weimer. Even the seat foam is a good example of feel over glam, as they stick with the stock foam over some of the lightweight options due to the riders liking the feel of stock. In our eyes, the only true unobtainable parts are the three main things that Honda supplies; like the suspension through Showa (honestly, the components are so close to kit level, it's not hard to get 90% of the way there through Showa directly), the brake caliper which HRC orders from Nissin to their spec, and the different first gear. Some of the other custom parts on the above list are obtainable or can be replicated through the right suppliers and with money in hand. Just as most factory teams, MCR has suppliers they pay to produce or modify a part (such as XPR or the seat base from Allan Brown), which really anyone can do with the right vision or info in mind. Lastly is the tires, as Brayton prefers a proto front tire. But as we learned through a recent chat with Dunlop's Broc Glover, these tires aren't always universally better as sometimes they have to be stiffer to cope with the increased forces of Supercross...meaning they actually could work worse for your average joe. If you've read this far and haven't watched the video or clicked on the interviews, we recommend you do so. In our Tested video we break down the feel of the bike and the experience riding it, while our interviews cover the three major figures in the bikes development. Great work on the writeup ML512. Bike is Niceeeeee! Very nice report. Can’t imagine Honda not giving Brayton what he wants, if he wants it.